Draw Manga man hair 4 different ways and styles male or guy. A basic Anime drawing instruction for hairstyle. This video shows you how to draw four different Anime hairstyle for boys. This should be easy for every artist to follow. If it is a bit too fast for you, press pause. Then you can keep drawing along. You will find video tutorial on the top. You can scroll down further to see step by step images with instruction. I begin with rough geometry sketch to finish pencil drawing and shading. You can watch the video tutorial demo with narration on drawing hair for Manga and below are step by step images education how to supplement for the art lesson. Here is a front view Manga face drawing that I already have so that I will just focus on hair drawing lesson. First style is going to be long spikes typical hair style. It has typical Manga hair for boy character. And now I am going to explain how I drew it step by step. It will be easy and simple to follow. Another quick and easy tutorial! 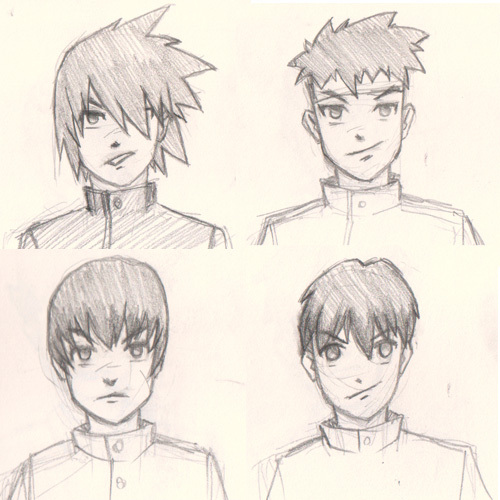 Here is a final drawing of Manga Hair for male 4 different styles. More guy hair style tutorials for Manga. Drawing Manga long spiky hair style. 1) I start with an simple geometry shapes drawing. Start with big shapes and then break it down into smaller ones. 2) Then I draw several more spikes on the top of his head, make sure they are going into the same direction. Tips: Make sure the spikes have variation of big and small, thick and thin, do not make them all even (unless intended). 3) Since I already have simple shape to go off from. I can now easily go in and draw detail over the established big shapes. Drawing hair tip 1) On the spiky Manga hair shape, Draw big then small or wide then thin or short and long. DO NOT make your hair spikes shape all even or the same shape, they will look strange. It is more natural looking with uneven split of hair clumps. Drawing hair tip 2) Start with bigger shape to establish the overall look first. Once you have the rough base to go on top, it will make your drawing a lot easier when try to add detail drawing. Below is a step by step drawing tutorial Manga hair style 2 How to draw Manga hair short spiky hair for boy. And follow the video drawing instruction with the below step by step images. No problem, if you are just looking for these very basic tutorials, you do not need any premium. Those are cater to more advance digital painting and college students who will go into gaming industry. hairstyles drive me crazy. I think i try to make too much detail in them. These help a lot as well.